We rattled through season two of House of Cards and finished it last night. Yes, the conclusion was inevitable, yes, Kevin Spacey is truly brilliant as Frank Underwood. And yes, like everyone else who has reviewed it, it wasn't as good as the first series. For me, the big problems lie in the rushed script and storyline. So many questions are left unasked, never mind unanswered. Characters behave in irrational and erratic ways with no attempt to explain - like the President resigning, like the FBI doing a deal with the ludicrous hamster-stroking Gavin, like everything to do with Doug and Rachel. So much time and effort is expended on storylines which go nowhere - Christina getting fired for example, it was like they just forgot about her. The constant presence of a noisy and lively demonstration outside the Underwood residence added another hyperreal layer of nonsense. Just about all characters had lines that you actually laugh out loud at, because they are THAT absurd. Jackie explaining why she has all those tattoos. Claire, well, pretty much everything she says. A lot of the politics didn't ring true either - not that I'd know - but it had a feeling like it was the West Wing, but with scumbags. Series 3 will be more of the same with the added presence of the Assange-like Gavin. Yes, we'll watch it, but it won't be worth the wait. 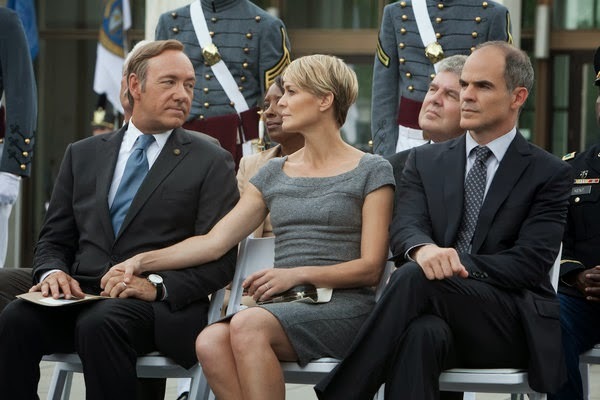 There are two problems for all mini-series now, which House of Cards has helped bring home. First, they simply suffer from a poor comparison to Breaking Bad, The Wire and The Sopranos - the High Concept, the powerful characters, the acting. But secondly, because it's on box sets, you tend to binge watch these days. On old fashioned TV, there's a lingering when something is left hanging, a number of stop-you-in-your-tracks moments that you'd collectively dissect the next day. I don't think House of Cards would scrub up to that level of scrutiny to be honest. You just want to rush to the end to see what happens. Did I do that? You may think so, I couldn't possibly comment.